“This kitchen mixes a variety of styles. The client wanted to complement the English Tudor style of her house, yet she has an eclectic taste. She wanted a bright kitchen so she chose white cabinetry instead of the dark cabinetry that would have been more colonial. 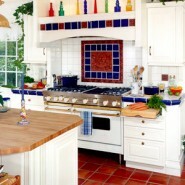 To add some contrast, she chose 12-inch-by-12-inch terra-cotta tiles for the floor and butcher block for the island countertop. “Because real terra cotta is very soft and can chip easily, it needs to be finished with a glaze once it has been installed and then periodically refinished. But it offers a special antique look and its earth tones add warmth, especially when used with the white cabinets.